Back in December one of my best friends hosted a bridal shower for one of her best friends. The bridal shower was held in December and she used Christmas as the theme. I was at her house after the shower and saw most of the decorations she made for the shower. The decor that stood out the most for me was the garland. She had made a fabric garland and put the brides future initials in front of the garland using some burlap. I was obsessed the minute I saw it. So obsessed that I immediately asked her how she made it and decided that I wanted to make one just like it for Ashley's baby shower. And that's what I did. And now I'm going to share it with all of you because it is SUPER easy and adorable and people will love it. They'll gush over it and obsess over it and demand to know how you made it. Step One: Choose your fabric. So I knew I wanted to go with a white and pink theme for the shower, typical "it's a girl" colors. So I went to Hobby Lobby and picked out 7 different fabrics. The key is for all the fabrics to be different. Different shades of pink and completely different patterns. I would also suggest waiting until your favorite fabric store (in my case Hobby Lobby) has a sale on fabric so that way you're not spending an obscene amount of money on this project. 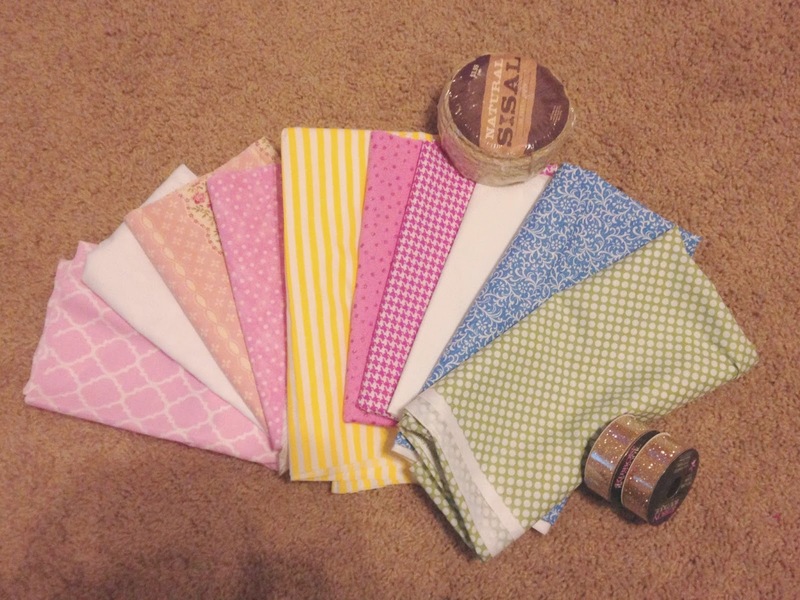 Once you've chosen your fabric you need to buy 1/2 of a yard of each. You may need 3/4 of a yard depending on how long you want your garland to actually be. Step Two: Cut all your fabric. 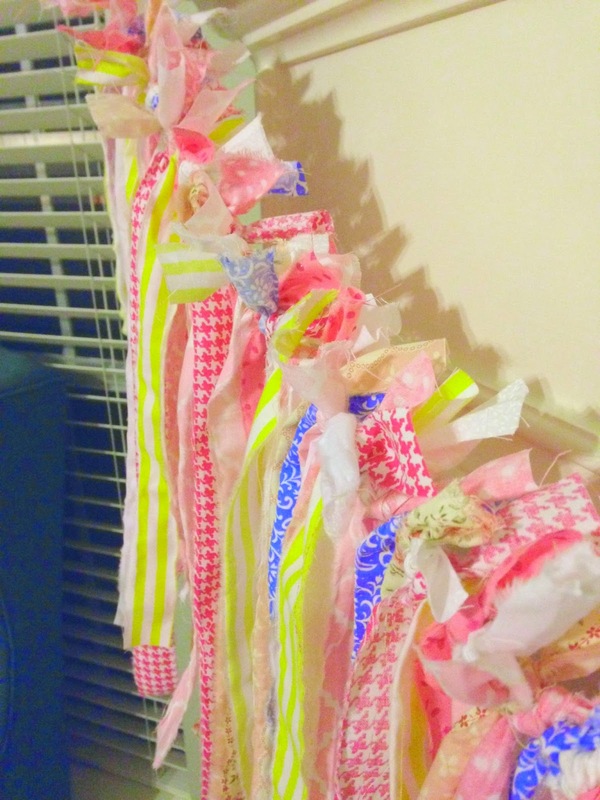 Now I am actually really lazy and when I started to realize that I was going to need a bunch of these strips of cloth I almost stopped making the garland. Oh and your fabric will look frayed since your ripping it apart and not cutting it, but that is okay! The frayed look is one of the things that makes this garland look so good. Step Three: Tie each strip to the rope alternating between each of your different fabrics. Because I didn't want to kill my back doing this, I went ahead and tied the rope to my fireplaces mantle. This made it so much easier when tying each piece to the rope. I even alternated between sides to make sure it was balanced correctly. Leave about an inch of the fabric above the rope to give it that frayed look. Step Four: Add your glitter ribbon. 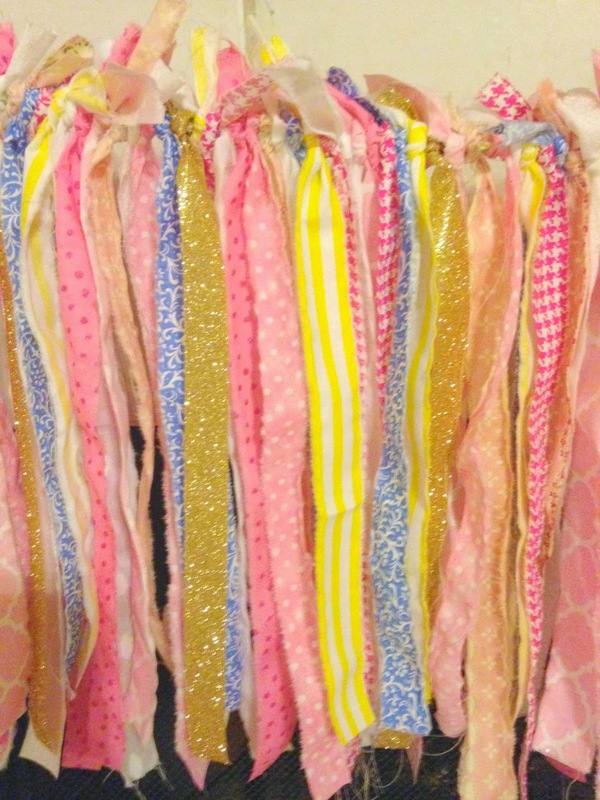 Once you have all of your fabric attached to your rope, then go in and add your glitter ribbon. I used two full rolls of the gold glitter ribbon. It added so much to the garland it's not even funny. 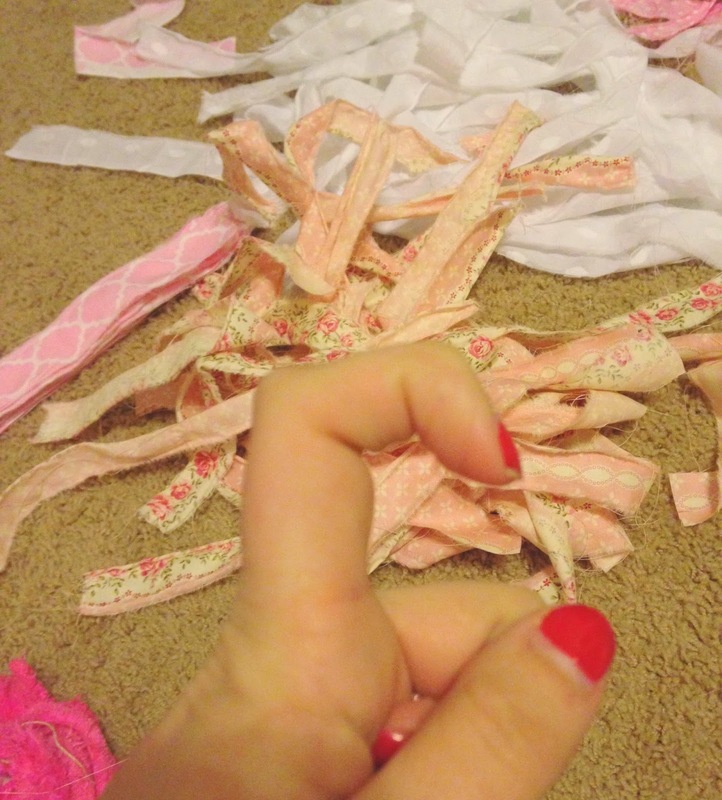 I cute the ribbon the same length as the rest of the fabric and made sure to buy 1 inch ribbon to go with my 1 inch strips. Step Five: Enjoy and let all your friend gush over how creative you are and how wonderful it looks. See easy peasy. I'm really glad I added the yellow and blue fabrics. It helped bring out the different pink fabrics really nicely. When I sent the final product to Ashtyn she said it reminded her of a Disney Princess. Which was PERFECT because as we all know I'm obsessed with Disney and so is Ashley. Seriously though y'all, this was the easiest thing in the world to make. It was a tad time consuming. It took me about an hour or two get it completely finished but it was so worth it in the end. 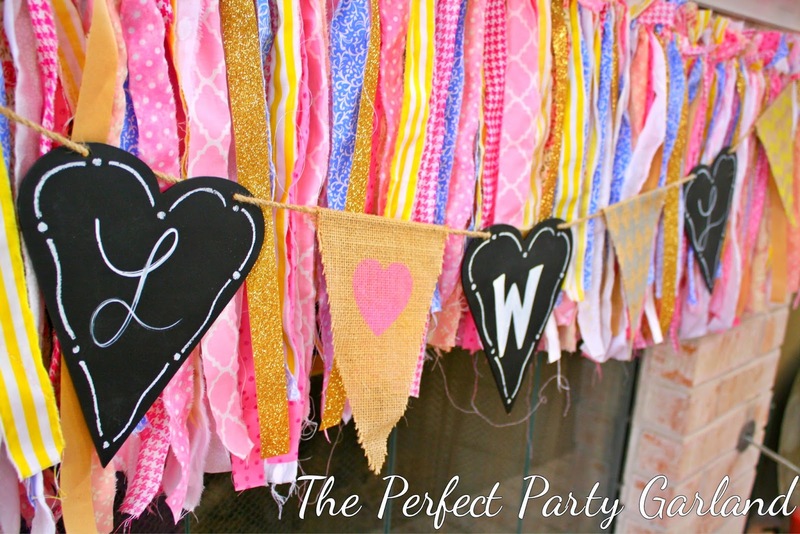 I was going to make my own initial burlap garland to go over it but I found the one you see in the picture at Hobby Lobby for 5 bucks and it had the cute chalk board hearts, so I was sold! Love this!! If I have to host any showers in the future, I am definitely going to want to do this! !